How do i deadhead coreopsis? Do I cut the flower off at the top or bottom of the stem? 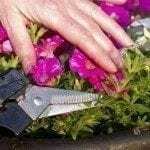 We trim ours off as far back towards the main plant as possible. More blooms will come in fairly sort order too!